There are many accidents caused by drunk drivers in Utah. Everyone knows that driving while under the influence of alcohol – known as DUI – is against the law in Utah, whether you’re in Salt Lake City, Ogden, Provo, or anywhere in between. The criminal aspects of DUI are serious, but people who drive under the influence and cause a car accident are also civilly liable for the damages caused to the victim of their actions. To recover in such cases you should call a Utah DUI accident lawyer at Salcido Law Firm. The car accident attorneys and personal injury lawyers at Salcido Law Firm PLLC are experienced advocates in personal injury and auto accident matters including those involving drunk drivers. We will help you recover the maximum amount to which you are entitled. When a drunk driver causes a car accident there is often times more to the story than just the fact that the driver was intoxicated. Often times the driver has left a bar or other place of business which served too much alcohol to the driver knowing that the driver could not safely get behind the wheel. In such situations the bar can be held liable in what is known as a dram shop action. Bars and other such businesses have a duty to not knowingly serve a patron too much alcohol. A Utah DUI accident lawyer at Salcido Law Firm have vast experience in complex matters that require in-depth investigation such as alcohol-related car accidents. Let our experience help you recover and get you through the difficulty of dealing with personal injuries from a DUI car accident. Trust us to track down the responsible parties in your drunk driving DUI car accident case. We serve all of Utah including Salt Lake City, Ogden, and Provo. Our experienced attorneys will help you understand who is responsible and what will need to be done to help you recover. Contact a Utah DUI accident lawyer at our firm to set up a free consultation. We will be able to tell you in a matter of minutes our game plan to bring those responsible for your injuries to justice. You can reach us by phone 801.413.1753 or 888.337.3235 or email. It’s time that you Get Protected! SLF competed in the Tempe AZ 140.6 Ironman Race in November 2018 to help fight child abuse. Thank you everyone who supported us in this important battle. How Does the Spousal Privilege Apply in a Utah Domestic Violence Case? How does Utah’s Divorce Statistics Compare to the Rest of the Country? What is the White Collar Crime Offender Registry in Utah? 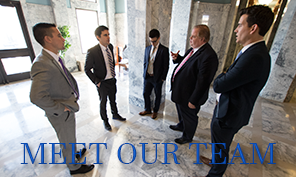 The attorneys at Salcido Law Firm PLLC represent clients all throughout the State of Utah including such areas as Salt Lake City, Ogden, Provo, St. George, Salt Lake County, Utah County, Davis County, Weber County, Cache County, Iron County, Washington County, and more.